Well, why not make your own after dinner mints? I have discovered a few reasons why not, but I’m sure that in the fullness of time I’ll be able to overcome them. Because I do love a good after dinner mint. In my search for likely recipes I once again marveled at the sheer range of ways to make after dinner mints. Again, the Americans have a whole different idea of what these constitute, I even found an Oprah sponsored recipe involving cream cheese. There was one that I’ve filed for future reference called Butter Mints, two of my favourite flavours, but that will wait for another day. I’ve used a recipe I found on the British Delicious Magazine website. It’s pretty simple. Melt one hundred grams of dark chocolate in a double boiler. Spread it over baking paper in a 20 by 28 cm baking tin. Stick it in the fridge to harden. Make a peppermint fondant by mixing one egg white with 110 grams of icing sugar and a tablespoon of peppermint essence, then mixing in a further 110 grams of icing sugar. They suggest colouring it with a drop of green food colouring, but we are above such things. 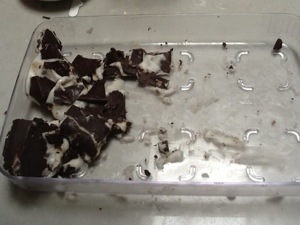 Spread this on the chocolate layer, then whack this in the fridge. When that has set, spread on a further 100 grams of melted dark chocolate, and back to the fridge it goes. Even by my low decorating standards, these were unacceptable. They did get eaten, though. I have found that after a couple of days in the fridge they have dried out a lot, so though they look sticky, they are not. I’m going to have another crack at these, I might investigate a more solid fondant and consider cutting them up with a hot knife and a lot more patience. Actually what would work is hot piano wire, but my piano wire is currently in use inside the piano. I’ll have to violate someone else’s piano.